ClubCoins Nødvendigt: 810 Please note that, for now, you cannot download content from our platform directly onto a mobile device (phone, iPod, iPad, tablets...). You need to download your items onto a PC or Mac, and then transfer them onto your device in the normal way. We are working on allowing direct downloads to mobile devices but this is not possible in the current version of the platform. Sorry about the inconvenience! Forced to become a child soldier, a sixteen-year-old Somali refugee must confront his painful past in this haunting, thrilling tale of loss and redemption for fans of A Long Way Gone and What is the What When Abdi's family is kidnapped, he's forced to do the unthinkable: become a child soldier with the ruthless jihadi group Al Shabaab. In order to save the lives of those he loves, and earn their f… reedom, Abdi agrees to be embedded as a spy within the militia's ranks and to send dispatches on their plans to the Americans. The jihadists trust Abdi immediately because his older brother, Dahir, is already one of them, protege to General Idris, aka the Butcher. If Abdi's duplicity is discovered, he will be killed.For weeks, Abdi trains with them, witnessing atrocity after atrocity, becoming a monster himself, wondering if he's even pretending anymore. He only escapes after he is forced into a suicide bomber's vest, which still leaves him stumps where two of his fingers used to be and his brother near death. Eventually, he finds himself on the streets of Sangui City, Kenya, stealing what he can find to get by, sleeping nights in empty alleyways, wondering what's become of the family that was stolen from him. But everything changes when Abdi's picked up for a petty theft, which sets into motion a chain reaction that forces him to reckon with a past he's been trying to forget. 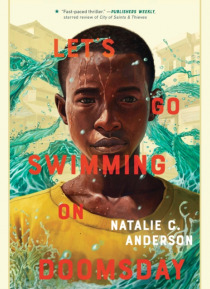 In this riveting, unflinching tale of sacrifice and hope, critically-acclaimed author Natalie C. Anderson delivers another tour-de-force that will leave readers at the edge of their seats.